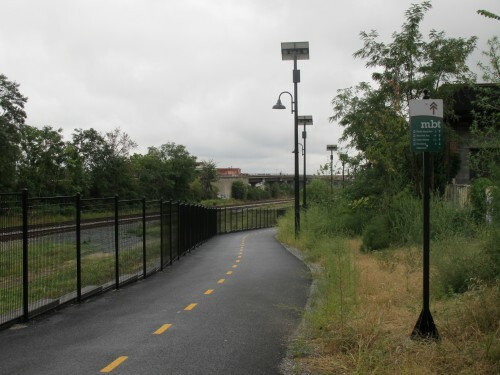 Another resident was attacked in an act of random violence on the Metro Branch Trail last evening around 6:30 PM between the NY Ave underpass and the R St exit on the trail while walking home from work. The victim was punched in the face by a 14 year old boy (in the presence of his 8 and 10 year old siblings?). No attempt was made to take any of her belongings. Your officers apprehended the suspects, so your team deserves credit in that regard. The situation is sad in so many respects and it is likely that since the assailants were juveniles they will likely not be punished in any meaningful way. My issue is that there has become a pattern of violence and theft in this area of the trail in recent weeks. Even after the shooting in the area there was little discernible uptick in patrols or police presence on the trail (aside from a cruiser with no officer present that was parked at the corner of the trail and R St. for about a week). This is NOT ENOUGH. Residents use this trail daily to commute to and from work and it deserves regular patrols from officers and proper sense of safety for those who use it. Honestly at this point, the trail has already gotten enough negative press (rightfully so) that many of my neighbors that I know are afraid to use it and find other, less safe and convenient from a pedestrian or cyclist standpoint, routes through the area. This only makes the issues on the trail more pervasive because with less regular pedestrian traffic the trail becomes more of a target to would be thieves and thugs who can now single out victims. MPD-5D has to seize the opportunity to turn around the rash of recent violence and make the trail safe for the community and hope that people return or watch as it devolves into a missed opportunity. This will likely only lead to more issues for your officers. This is a tipping point for me and likely many of my neighbors with regards to the trail. The recent violent activity on the Metropolitan Bike Trail has been on our “radar” and at the forefront our course of action. While the officers were not able to prevent this offense from occurring, they were on the trail at that time and coordinated to cut off the escape routes of the individuals as they attempted to flee. The safety of the citizens on the trail is paramount to the Fifth District. As such, we have tactics that are not being disclosed to address this problem. As officers continue to patrol this trail on mountain bikes, we are convinced we will eliminate these incidents and will place a few more officers on the trail in order to spread out and cover the entire area. I appreciate your concerns and hope you will contact us with any future matters. Thank You. We last spoke about crime on the MBT on Jan. 26th.